The news is full of stories about upcoming budget cuts, and that will continue until the legislature adopts a budget later this summer. The coverage is inevitable and important given the historic budget crisis confronting North Carolina. My interest is in keeping you informed about what is happening and its likely consequences for the School. This post will give you some context for understanding the magnitude of the state’s budget woes, and it also will explain the round of cuts that the School received last week. The budget challenge facing North Carolina is the greatest since the Great Depression. In a nutshell, the state is facing a gap of $3.7 billion between expected revenue and projected expenditures for fiscal year 2011-2012 (which starts July 1, 2011). A variety of factors are contributing to the gap, but there are two big ones. The first is the expiration of $1.6 billion in federal stimulus funding that was used to cover recurring expenditures in the budget. The second is the expiration of a 1% increase in the sales tax that has generated $1.1 billion in revenue. The stimulus money will not be replaced by the federal government, and the prevailing expectation is that the 1% sales tax increase will not be continued. When combined with $1 billion worth of other factors, the result is a deficit of $3.7 billion. The focus is on closing the gap through cuts that reduce expenses because it is unlikely to happen through increased taxes or other state revenue. The campuses have been instructed by President Ross to plan for a possible cut of 15% to our state funding. The $3.7 billion shortfall amounts to approximately 17% of the state budget. Education is the largest category of the budget (57%) by a wide margin, and universities account for 14.1% of total state spending. Most of the education spending is discretionary. Other state budget categories contain more spending that is legally mandated, as well as more linkages to federal funding that will be lost if there is a cut in state spending. Funding for education therefore will be under enormous pressure in the upcoming legislative session. There is no way to predict exactly how much university budgets finally will be cut. Chancellor Peacock at Appalachian State University, for example, has instructed his campus to prepare for a possible 20% permanent cut to their state funding. I am working with our Budget Committee (Tom Thornburg, Todd Nicolet, and Brad Volk) on two different planning scenarios—15% and 18% permanent cuts to our state-appropriated budget. These scenarios translate into potential cuts of roughly $1.3 million and $1.5 million for the School. The legislature and the campus may take actions that reduce the permanent cuts for the University. For example, Carolina might impose an across-the-board tuition increase that would offset a portion of the budget cuts. It is impossible to predict what will happen, however, and so we are planning for the possibility of severe cuts to the School’s state funding. In addition to working with the Budget Committee, I also will seek advice from the other members of the Management Team and the Dean’s Advisory Council on how to meet these cuts. We received our most recent round of cuts from South Building last week, and I want you to know what it means for the School. This round has two different components. We learned that our cut for the current fiscal year is $357,143, which is 4.2% of our state funding. This is a so-called non-recurring cut, which means that the School must give back the money during the current fiscal year. This sometimes is called a temporary cut because the money normally would be returned as a part of our state budget allocation for the next fiscal year (beginning July 1, 2011). We have several possible sources of one-time money available to meet this non-recurring cut, and we must tell the Provost’s Office how we will do it by March 1. This temporary cut is a significant loss of funds for the School, obviously, but we should be able to absorb it without taking any other special actions. We also were told last week that the School’s state budget for next fiscal year (2011-2012) will be cut permanently by $510,204, which is 6% of our total state-appropriated funding. The interesting twist is that this cut must be fully implemented by the end of the current fiscal year. It means that we are getting a head start on absorbing our permanent cuts for next fiscal year, which makes sense because postponing these inevitable cuts will only make things harder later. 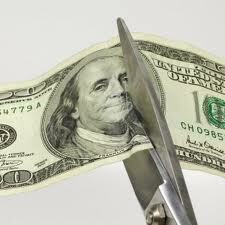 This cut will count toward our total permanent cut in state funding next fiscal year. How Will We Meet the Recurring Cut? We took a variety of actions last fiscal year to meet our 5.5% permanent state cut for the current fiscal year, and we also generated a reserve of state funding for future permanent cuts ($277,000). That amount will be applied to help meet this first installment of our new permanent cut for the 2011-2012 fiscal year. It comes from a combination of (1) increased fees (courses, publications, and advising), (2) permanent cuts (vacant state-funded positions that we eliminated in printing, mailing services, economic development and human resources; the elimination of print publications—Popular Government and North Carolina Legislation), and (3) reduced operating costs. This fiscal year the School also received a new state-funded faculty position ($120,000) from the Provost’s Office to support the MPA Program and to work with public officials. We will return that faculty position to help meet this cut to our state funding, which I believe is exactly what the provost expected would happen. After applying these two sources of recurring state money, we still must find another $113,204 to meet this cut of $510,204. I am considering several options for meeting the current cut, but I am even more concerned about meeting the additional cuts in state funding for next fiscal year. We have lost 14.5% of our state funding over the last two fiscal years. It is plain to me that it will be challenging to meet our cuts for next fiscal year, especially if our total cuts approach the worst-case scenario of 15% or more. I will be working even more closely with the Budget Committee, the Management Team, and the Dean’s Advisory Council on how we meet those cuts. I will keep you informed as decisions are made. You can continue to do an excellent job in meeting the needs of public officials. Our budget also depends on local government membership dues and receipts from courses, publications, and advising. Those two sources of operating revenue need to remain strong to help us weather the storm of reduced state funding. Local governments paid their membership dues this fiscal year in record numbers, which is a tribute to your work with them. Receipts are holding steady with last fiscal year, but that is only because we increased our fees—which we probably cannot do again next fiscal year. Cities and counties will be under great financial pressure, and so providing them with programs and services that respond to their needs will be critically important. You can identify permanent cost savings. Temporary savings are important, but they can’t be used to offset permanent cuts in state funding. If we can identify ongoing cuts in operating expenses, however, the School can use the saved money to replace state funding that we lose through cuts. In the past this has allowed us to meet budget cuts by moving some members of our professional staff from state funding to receipts funding that was made available through cost savings. Please share any ideas for cost savings with Brad Volk. You can help identify new and expanded revenue streams to support the School’s work. Faculty members who are deciding how to spend their time should choose activities that generate revenue whenever reasonably possible. Is there a new course that responds to an unmet need? What about a new publication? Is there an opportunity to commit more time to advising that public officials will pay for? These activities can be used to offset cuts in state funding if we believe that they will generate a permanent increase in receipts. I know that many of you already are thinking along these exact lines and I appreciate it. Faculty members should consult with Tom Thornburg for guidance in thinking about new and expanded revenue streams. Most importantly, thank you so much for all of your work on behalf of the School. Your work is important and I appreciate your ongoing commitment to our mission. I am especially proud of how positively you have responded in the face of the current budget crisis. This coming fiscal year will be a difficult one, but I am optimistic that we can meet our budget cuts and continue to strongly advance the School’s mission. The more open we are to change, the easier it will be, and even then it will be hard. I look forward to working with you as we meet this challenge together—I can’t imagine doing it with a better group of people. As always, I appreciate how you share all of this information with us.